When I joined NIGMS about four years ago, I was struck by the number of press releases from journals and grantee institutions that came across my desk each day. Many of them focused on a recently published paper and failed to explain how the work fit into the broader field. Others overstated the research results to make them sound more exciting and closer to clinical application. I moderated one of the panel discussions. Around the same time, science communicators started writing articles and conducting studies about the effects of hyped research findings (e.g., Schwartz et al., 2012; Yavchitz et al., 2012 , Sumner et al., 2014 ; Vox, 2017 ). 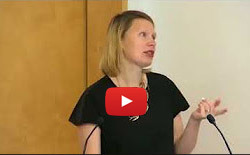 While these discussions focused on clinically oriented research, we at NIGMS began thinking deeply about how the issue relates to basic biomedical science. On the heels of our work with the Federation of American Societies for Experimental Biology (FASEB) on enhancing rigor and reproducibility in biomedical research, we started talking to them about this topic as well. Two years later, we were pleased to host their Workshop on Responsible Communication of Basic Biomedical Research: Enhancing Awareness and Avoiding Hype . 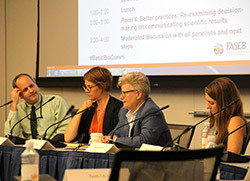 The June 22 meeting brought together a diverse group of science communicators [PDF, 22KB] who included early and established investigators, researchers who study science communication, academic and corporate communication officers, policy advisors and journalists. Each panelist represented a stakeholder group with a role in what panelists later called the “hype cycle” and shared his or her perspectives on the problems of hype, the incentives that cause it and recommendations for avoiding it. The meeting focused on basic biomedical research, but the discussions were also relevant to other areas of science. In her keynote address , veteran science journalist Erika Check Hayden defined hype as “exaggerating the outcomes of research, for whatever motives people have, leading to potential negative effects due to inaccurate portrayal of research.” She credited this definition to Judith Greenberg, our deputy director. The keynote address by Erika Check Hayden focused on new directions in science communication. The subsequent discussions highlighted the shared responsibility among all the stakeholder groups for improving science communication and changing the incentives for it. Panelists acknowledged that scientists sometimes oversell the conclusions of studies hoping to get their work published in “better” journals or to improve their chances for obtaining funding; journals may decide on manuscripts to publish based on which ones they think will be cited the most or get press attention; communication officers and journalists are often judged by how many hits their stories get; and universities and research institutes may consider the fundraising potential of scientific news stories.